Forget Strada and Sport modes. In the Performante Spyder you need only engage the full-fat, manual-shift cacophony of noise and adrenaline that is Corsa. It’s a configuration that perfectly matches this athletic Italian’s aggressive aesthetics. Performante isn’t a normal Huracán. Its unique twin circular exhausts, in place of the ‘standard’ car’s oval quads, poke proudly from the rear valance – they’re your pair of canon - and fire harmonic volleys that bounce right back off the towering grey vertical stone walls encircling gleaning turquoise Fjords as the roads slice in between. We’ve long adored Lamborghini’s V10s for their sonic symposia, but in this incarnation, with the fabric roof electrically squared away, it’s rank decem decadence. What about that V10 engine? Does all-wheel-drive hinder or help? 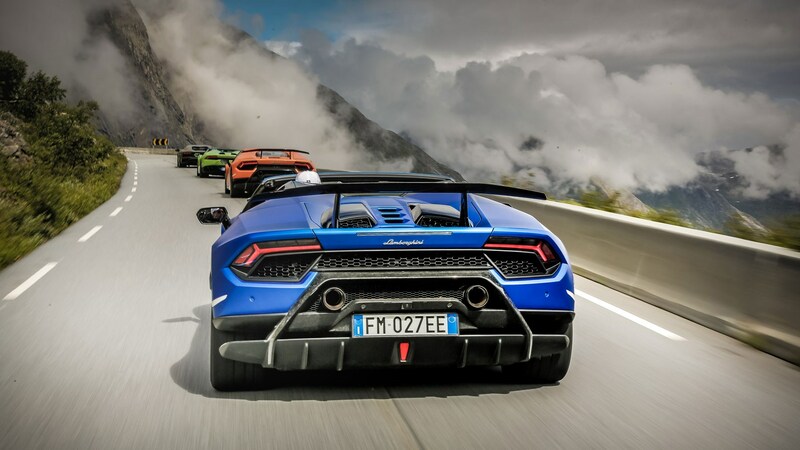 Pull a column-mounted paddle and gearchanges punctuate proceedings rather than dominate in the way an Aventador’s can, which lends an approachability that matches a firm-yet-fine suspension setup. Moving up into the stunning mountains, a polished pairing of refined rebound control and active aero affords confidence at any speed, the fifth-gen Haldex all-wheel drive system only proving a hindrance through the sharper switchbacks on our route where a prod of the right pedal pushed the nose wide, rather than the tail out. You’ll need a rear-driven Huracán for skids. That isn’t to say it isn’t a car for drivers, though. Lamborghini’s chassis team has bestowed the Performante with a front end that’s decently convivial with the driver, and the result is a great deal of information regards goings on under those 20-inch Pirelli P Zero Corsa tyres. Push hard, and then harder, and more, and you’ll still struggle to find the limits of this car’s adhesion to the road. 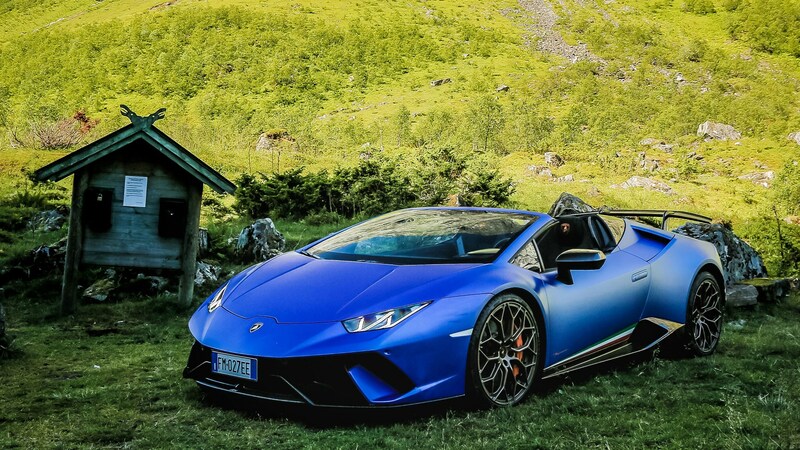 Even on a gravel track there was considerable effort required to give the locking rear diff something to do – and all credit to Lamborghini for giving us the chance, in a car worth more than the average British house once options are included. But it is fair to say this isn’t a car for the loftier among us. That roof robs cockpit space, and this six-foot-flat tester only just managed to coax the thin (but well bolstered) electrically adjusted sports seats into a position conducive to serious Performante pilotage; and even then felt a little too close to the steering wheel for complete comfort. Not an issue in the coupe. Is it just as impressive inside? We did appreciate some of the finishing in the cabin – like the unusual-yet-attractive forged composite material also found on that imposing (but ultimately essential) rear wing and diffuser decoration. Inside, the chinzy gloss-black plastic facing the passenger, the aging multimedia system and some of the switchgear could be from a car of half this price. 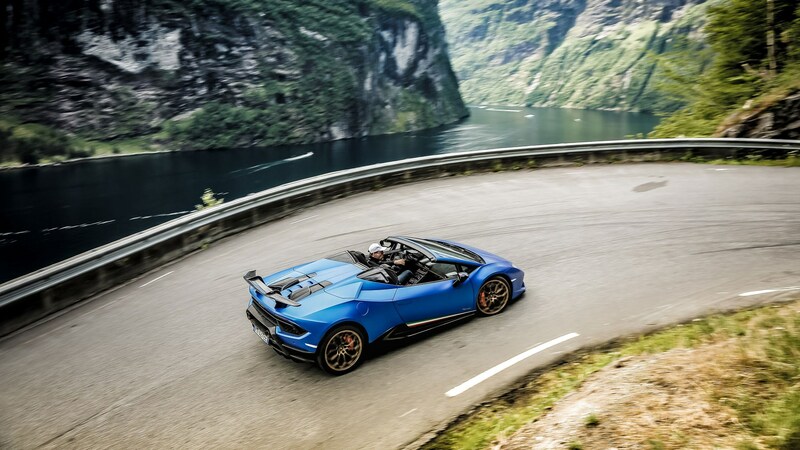 If you’re after proper drop-top supercar thrills on any given day, and any given speed, you’ll have to dig seriously deep into the trust fund or score a bigtime bumper bonus to find a car as rounded as the Performante Spyder.